NEW DIME PIECE HAS LANDED!! IT'S THAT TIME OF THE YEAR AND DIME PIECE HAS GONE ABOVE AND BEYOND ONCE AGAIN :) CHECK OUT THE NEW LINE IN STORE NOW!! DIME PIECE IS ONE OF THOSE LINES THAT KEEPS US ON THE EDGE OF OUR SEATS. ALWAYS COMING OUT WITH FRESH DESIGNS THAT NEVER CEASES TO AMAZE US! DON'T MISS OUT ON THIS COLLECTION IT'S THE PERFECT SPRING/SUMMER GEAR TO MAKE YOUR NIGHTS HOT! PAUL WALLS CLOTHING LINE, "EXPENSIVE TASTE" IS BACK AT TIMEBOMB! BE SURE TO GRAB YOUR BANDIT BANDANA (ABOVE) AND REMAIN UNDERCOVER IN THE STREETS! THE ENTIRE SPRING T'SHIRT RUN. "YOUR CASH AND YOUR JEWELS ARE WHAT I EXPECT!" DRIVE IT LIKE ITS STOLEN AND THE CHOICE IS YOURS! WE'RE KILLIN' EM SOFTLY HERE AT TIMEBOMB! STOP THRU TO GET YOUR EXPENSIVE TASTE! SOLD EXCLUSIVELY AT 200 S. HIGHLAND AVE. MONDAY-SATURDAY 12-8. JUST IN THE NICK OF TIME ALIFE HAS COME THRU TO DELIVER THE NEW SPRING KICKS! COLOR IS IN FULL EFFECT THIS SEASON WITH WAVES OF GREEN, PURPLE, AND ORANGE; AND WITH THREE DIFFERENT STYLES THERE IS SURE TO BE AN ALIFE FOR YOU! STOP BY TIMEBOMB TO CHECK THEM OUT FOR YOURSELF! AS YOU KNOW WE KEEP IT EXCLUSIVE AT TIMEBOMB SO GET HERE FAST BEFORE THEY ARE GONE! OPEN 12-8 PM MONDAY-SATURDAY. THE NEW BOAZ ALBUM "THE AUDIO BIOGRAPHY" IS IN STORES TODAY!!!! 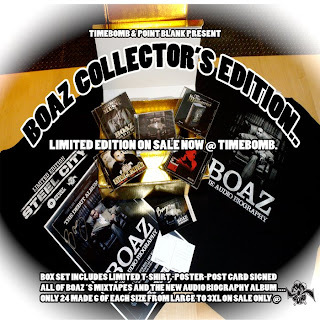 BUT ONLY HERE AT TIMEBOMB CAN YOU GET THE LIMITED EDITION-COLLECTORS SPECIAL BOAZ BOX SET!! THERE ARE ONLY A FEW LEFT AND GOING FAST SO GET YOURS!!! THE STREETS ROLL DEEP THRU TIMEBOMB TO SHOW THEIR SUPPORT! BOAZ IN STORES NOW! GET YOUR COPY BEFORE THEY ARE GONE!! 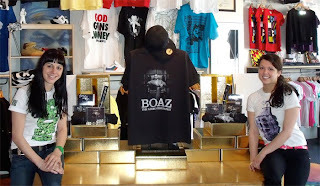 THE LIMITED EDITION-COLLECTORS SPECIAL BOAZ BOX SET INCLUDES ALL 4 OF THE BOAZ MIXTAPES, THE NEW ALBUM "THE AUDIO BIOGRAPHY", A SIGNED POSTER AND POSTCARD, AND A BOAZ T'SHIRT! AS YOU ALL ALREADY KNOW WE HERE AT TIMEBOMB ARE THE BEST AND WE ONLY MESS WITH THE BEST!! SO COME GET YOUR LIVES RIGHT WITH US AND SHOW YOUR LOVE TO THE LOCALS! OPEN NOON TO 8. STOP THRU TODAY!! Labels: BOAZ .STEEL CITY.TIMEBOMB SPOT . THE TIME HAS COME FOR WHAT WE'VE ALL BEEN WAITING FOR! 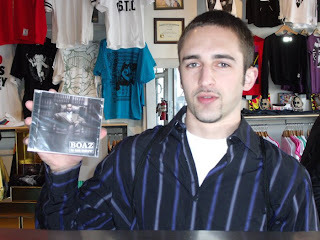 THE NEW BOAZ CD "THE AUDIOBIOGRAPHY" IS ABOUT TO DROP, BUT ONLY HERE AT TIMEBOMB CAN YOU PICK UP THE LIMITED EDITION, COLLECTORS EDITION BOAZ BOX! 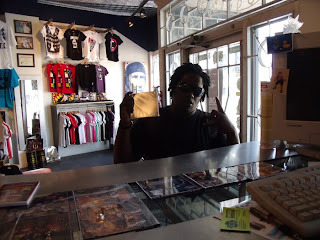 THIS GOLD BOX INCLUDES: A BOAZ T'SHIRT, SIGNED POSTER, SIGNED POST CARD, ALL FOUR OF HIS MIXTAPES, AND THE NEWEST SOUNDS OF THE STREETS, THE AUDIOBIOGRAPHY! THIS IS A LIMITED EDITION COLLECTORS ITEM AS THERE ARE ONLY 24 BOXES! COME AND GET YOURS! GET YOUR LIFE RIGHT! "THE AUDIOBIOGRAPHY" WON'T BE IN STORES UNTIL MARCH 17! BUT YOU CAN GET THE ENTIRE SET NOW! ONLY AT TIMEBOMB! NEW CROOKS & CASTLES JUST TOUCHED DOWN ! THE NEW CROOKS AND CASTLES HAS DROPPED AT TIMEBOMB! 14 NEW T SHIRT STYLES ALL REMINDING US THAT THE SREETS ARE ALIVE AND FULL OF STYLE. STOP DOWN TO TIMEBOMB, THE ONLY OFFICIAL SPOT IN THE BURGH FOR CROOKS AND CASTLE!! CROOKS "GOD GUNS & MONEY"
PITTSBURGH 2009 HIPHOP AWARDS ! 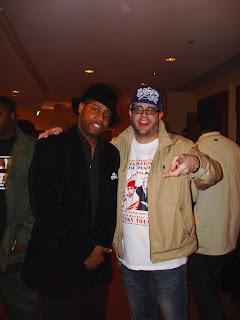 SHOUTS TO EVERYONE WHO ATTENDED THE 2009 PITTSBURGH HIP HOP AWARDS. BIG UPS TO ALL THOSE NOMINATED AND THOSE WHO WON. 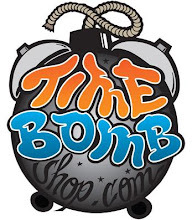 AND THANK YOU AGAIN FOR VOTING TIMEBOMB PITTSBURGHS BEST HIP HOP CLOTHING STORE. CHECK OUT THE LIST OF WINNERS BELOW! CD OF THE YEAR - FORMULA 412 "THE DIFFERENCE"
SINGLE OF THE YEAR - S. MONEY "BREAD WINNER"
MIXTAPE OF THE YEAR - PLAYBIZZLE "TRANSPORTER 2"
COMMUNITY ORGANIZATION OF THE YEAR - COMMUNITY EMPOWERMENT ASSOC. BEST HIP HOP VIDEO OWEY - "SHE WANTS A THUG"
TIMEBOMB & DISSISIT IN VEGAS ! LAST WEEK BRICK WENT TO VEGAS AND HELD IT DOWN FOR TIMEBOMB AT THE MAGIC SHOW. KICKIN IT WITH THE HOMIES FROM DISSISIT. BIG DANNY BOY O'CONNER, HOUSE OF PAIN FAME. AND BIG SLICK. KEEP POSTED FOR THE LA COKA NOSTRA SHOW WITH THE KOTTONMOUTH KINGS COMING TO PITTSBURGH. ALSO LOOK OUT FOR AN IN STORE APPEARANCE WITH LA COKA NOSTRA! CHECK OUT THE DISSISIT SPRING COLLECTIONS ON SALE AT TIMEBOIMB THIS MARCH !